Hillary Clinton released a new video celebrating her effective victory in the Democratic presidential primary. Set to play before Clinton takes the stage at the Brooklyn Navy Yard tonight, the video acknowledges Clinton’s historic role as the first female presidential nominee from a major party. The video splices together some of Clinton’s most notable speeches with b-roll of important moments in the women’s rights movement in America, including the fight for women’s suffrage, the women’s liberation movement in the 1960’s and 70s’, and quotes famous female political activists like Gloria Steinem and Rosa Parks. Clinton is set to address supporters in Brooklyn later on Tuesday as the final 6 primary states will all-but-certainly give Clinton the greatest number of popular votes, pledged delegates, and superdelegates. 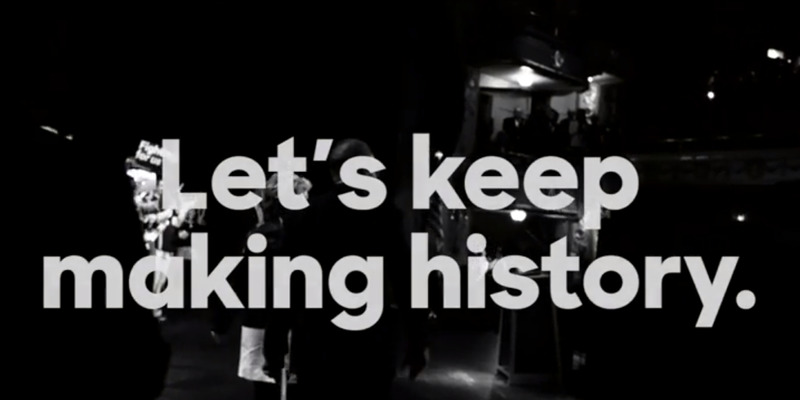 The new ad comes on the eight-year anniversary of Clinton’s decision to concede the Democratic primary to then-Sen. Barack Obama in 2008. And in perhaps a slight nudge to Sen. Bernie Sanders, whose campaign has insisted that it will carry on until the Democratic National Convention late next month, Tuesday’s video ends with audio from Clinton’s own speech endorsing Obama at the 2008 convention.